Posted October 15th, 2017 by Jeremy Dalton. Service South can help you with home theater installation in Atlanta, Fayetteville, Griffin GA, Marietta, McDonough or Newnan GA. They are home entertainment and home automation specialists and they deal in quality products, offer excellent customer service. Their experienced and knowledgeable staff will design build and install your dream home theater system. You can also a have a true cinema experience in your home with professional home theater installation. It starts with proper design. This means the right mix and match of electronics, acoustics, lighting, control and aesthetics. Professional home theater installation should adhere to THX and CEDIA standards to help ensure the best performance and experience possible. This way you get perfect functionality with easy to use interfaces and control systems. Once of the first things to consider when it comes to home theater installation is the scope of your project and your budget. Maybe you only want a small-scale home theatre which could fit into the category of a media room? Maybe you want something more elaborate with cinema seating, advanced automated controls for high-end features? Multipurpose media rooms might be a good option if want to have several entertainment options in a certain room. The next step is to find the right installer. You should preferably deal with a CEDIA (Custom Electronic Design & Installation Association) certified installer. The expert home theater installer at Service South can transform any suitable room into a dedicated home theatre or state of the art multipurpose media room. They use hidden components which helps to preserve the aesthetics and décor of your space. They install both wires and wireless systems and their work is discreet and professional. 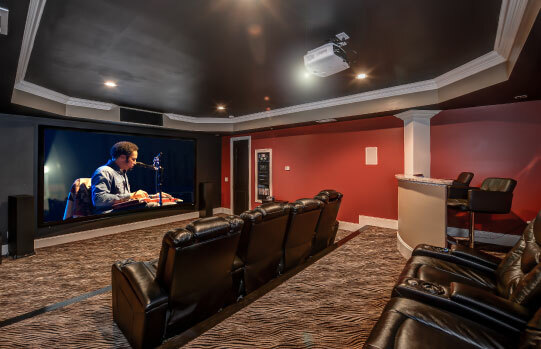 The can help you with home theater installation in Atlanta, Fayetteville, Griffin GA, Marietta, McDonough or Newnan GA.
Home Theater Installation in Atlanta, Griffin, and surrounding areas, including Newman & Marietta. Offering Home Automation, Home Audio Installation, more.